- What's she working on? Perfecting her donut recipe (a thing worth waiting for if I've ever heard of one). - So who is this lover-ly lady, anyway? She oh-so-charmingly describes herself as "a total fat kid who loves to eat bad food and play with recipes" - Amen, sister! - How will she make my day extra fancy? 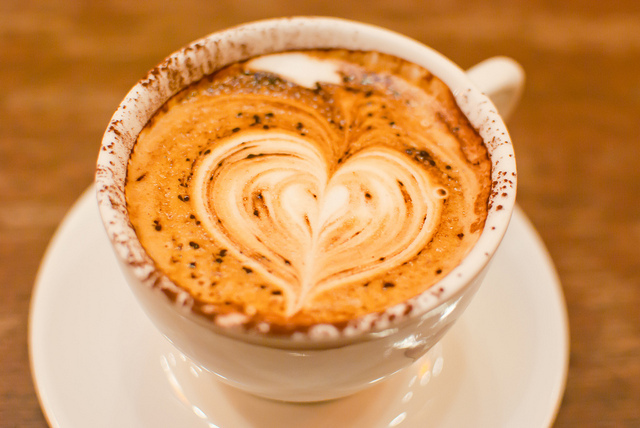 Her schmancy lattes/cappuccinos will feature equally fancy designs on top, like hearts, ferns and rosettas. - What's her shop's style? Modern, Spanish rustic. You'll see Spanish tile, reclaimed wood, handblown glass fixtures and antique metal chairs. Not too many seats: 10-12, but lots of opportunities for taking your goodies along with you. - When does she open her doors? Hopefully October 1st. So come the fall, show our new neighbor some love. I'll be first in line! Can it be!? New Coffee Shop on Bedford St!